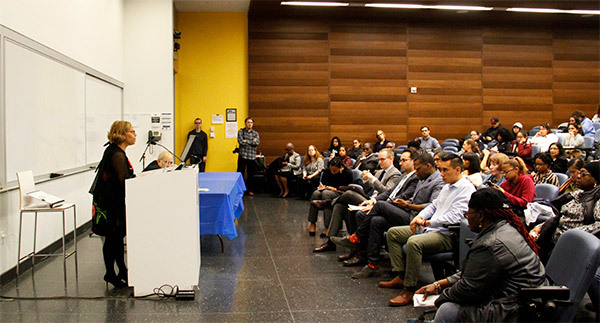 Solitary confinement has become a critical issue in criminal justice reform, and this April, John Jay College, in partnership with The Center on Media, Crime and Justice, Public Square Media and National Religious Campaign Against Torture (NRCAT), hosted Solitary Confinement Week, a weeklong series of events designed to educate journalists, advocates, John Jay community members and the general public on the adverse effects of prolonged isolation. In addition to a symposium titled “Rethinking Solitary Confinement: Where Do We Go From Here?”, a walk-through, replica solitary cell was installed on John Jay’s campus, where participants learned about the negative mental and physical effects of being held in isolation for up to 23 hours a day in a tiny six-by-nine-foot cell. Participants also used virtual reality headsets to get a better understanding of the psychological damage caused by solitary confinement. Johnny Perez, Director of the U.S. Prisons Program with The National Religious Campaign Against Torture (NRCAT), has experienced solitary confinement firsthand and is now an advocate for the abolition of solitary confinement, a practice that he and NRCAT believe constitutes torture. He says that educating students on the realities of mass incarceration is important, especially for John Jay students who will become future criminal justice leaders. President Karol V. Mason expressed admiration for Perez and the advocates who participated in the weeklong series who are working towards criminal justice reform. “Johnny Perez spent three years in solitary confinement, but he is still able to do this work and make sure other people don't have that experience,” she said. “There's so much talent locked up in our criminal justice system."